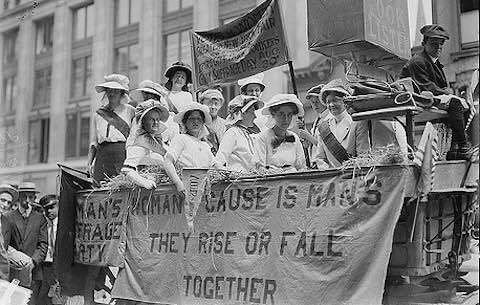 I doubt today's working world is what the suffragettes were thinking of 100 years ago when they marched for a woman's right to vote and a few other crumbs of equality. I doubt, too, this is what mid-century feminists expected when they knocked on boardroom doors and corporate glass ceilings. Those pioneers wanted opportunities. They wanted alternatives. They wanted to change society -- enhance, improve and feminize the old system of business and politics as usual. Fast forward a few decades, and the remnants of these great expectations remain in unlikely places. "Women bosses are the worst," a friend griped the other day. She had been reassigned to a new job, new department, new supervisor. "You'd think they would be more flexible and more understanding of family commitments. But it's just the opposite." I argued that female bosses were no different than their male counterparts. She disagreed. "Most of them are too busy acting tough to be themselves," she insisted. "They want to out-man the men." The quality of women bosses has been a perennial source of debate among the working class, but my friend's words came back to me when I read about the hotly contested Nevada Republican primary for the U.S. Senate. One GOP candidate, Sue Lowden, accused her come-from-behind opponent, Sharron Angle, of fudging her resume when Angle said she had co-founded a one-room Christian school. I guess women can't accuse each other of falsifying their military service, so they point the finger at their religious commitment. Angle, by the way, won the primary anyway. In another race, two men claimed they had sexual relationships with Nikki Haley, the married candidate who this week moved on to the GOP runoff in South Carolina. Haley has vehemently denied the accusations, but the whispers landed her name in the same sentence with that of Mark Sanford, the state's unforgettably wayward governor. Not a good place to be. All the finger-pointing raises the question: Now that they're being accused of behavior traditionally associated with men, have women finally arrived? Politics has always made for strange bedfellows but, truth is, the gender gap has blurred in other fields, and not always for the better. A recent study by Allstate Insurance found that more girls were likely to speed than boys. They were also more likely to talk on a phone or text while driving. While insurance rates remain higher for teenage boys, an Allstate spokesman admitted that girls' bad habits are closing in on boys'. Teachers have observed the same disturbing trend. Girls are fighting more in school, too. This is not just about teens, though. A study released earlier this year by Marquet International, an investigative and security consulting firm, found more women are committing complex financial crimes. They were the perpetrators in 63 of 415 cases involving thefts of $100,000 or more in 2009. Men did embezzle more money, but as women pursue higher-level jobs, that, too, might change. Which brings me back to my friend's premise about women out-manning men. She believes -- and I've heard this argument before -- that some women have lost their souls in their search for equality. Bosses, politicians and teen drivers are examples of a shift to more assertive and aggressive behavior that doesn't always play to our advantage. Is that true? Have we shed our best qualities? In trying to reach the tarnished brass ring, have we forgotten to bring along our empathy, our listening skills and our scrub brushes? Woman to Woman: "We've Come a Long Way in Wrong Direction"